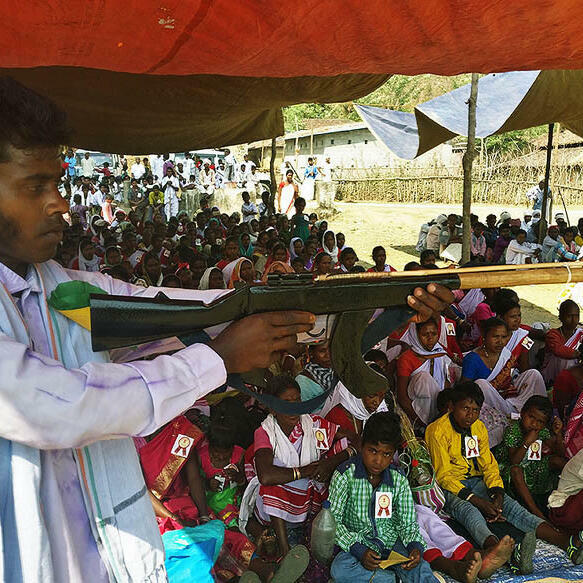 Thousands of men, women and children from 30 villages are swarming all over Sonpur, a tribal hamlet located deep in forests, around 100 km from the nearest city—Ranchi. The village is hosting a Patthargarhi (installation of stone) ceremony, at the conclusion of which it will constitute a gram sabha, swear to boycott elections, stop sending its children to government schools and promise not to enroll for any government identification, including voter ID and Aadhaar. Besides, state police and elected representatives will not be allowed in these villages anymore. Mathematics and science are not taught at the schools of ‘Adivasistan’ in a district in Jharkhand since the tribal leadership is still deliberating on their syllabi. Three such schools, in Udburu, Jikilata and Uldi, are running in Khunti right now. These schools now have students from over a dozen villages. The government schools and the teachers teaching there have been left with barely any students. A television journalist was killed in Madhya Pradesh’s Bhind when a speeding truck strayed from the road and mowed him down on Monday. The deceased, Sandeep Sharma, had conducted a few sting operations on the local sand mafia and the alleged involvement of the police. The Congress found itself on a sticky wicket after it had to take down its app amid allegations that the data captured by it was being sent to Singapore servers. The Congress has been targeting the ruling BJP over the Narendra Modi app - the official mobile app of Prime Minister Narendra Modi – alleging that it sent user data to a US-based company without consent. The Congress will not only return to power in Karnataka but will also end up improving its tally in the 224-member Legislative Assembly, a pre-poll survey conducted by C-Fore predicted. The survey was conducted between March 1 and 25 and spoke to 22,357 voters across 154 assembly constituencies. The respondents were spread across 2,368 polling booths covering 326 urban and 977 rural locations. BJP, the survey said, will have 31% of the vote and JD (S) will have 16%. The Supreme Court extended the interim protection against arrest to Karti Chidambaram, granted by the Delhi High Court in the INX Media money laundering case, till April 2. As the most famous resident of their village continued his indefinite hunger strike in Delhi, people in Anna Hazare's Ralegan Siddhi replicated actor Dharmendra's protest atop a water tank in the iconic film "Sholay" to support the social activist's demands. A group of residents of the village, located in Parner tehsil of Ahmednagar district, climbed atop the water tank, and shouted slogans demanding that the government should accept Hazare's demands, which include the appointment of a Lokpal at the Centre and Lokayukta in states. The Supreme Court has agreed to examine the constitutional validity of the prevalent practices of polygamy and 'nikah halala' among Muslims and sought responses from the Centre and the Law Commission. In a disturbing incident reported from MP university, a woman warden allegedly strip-searched 40 girl students after a used sanitary pad was found dumped in the hostel premises.